These are bloom streaks in the York River beneath the Coleman Bridge on July 27, 2017. 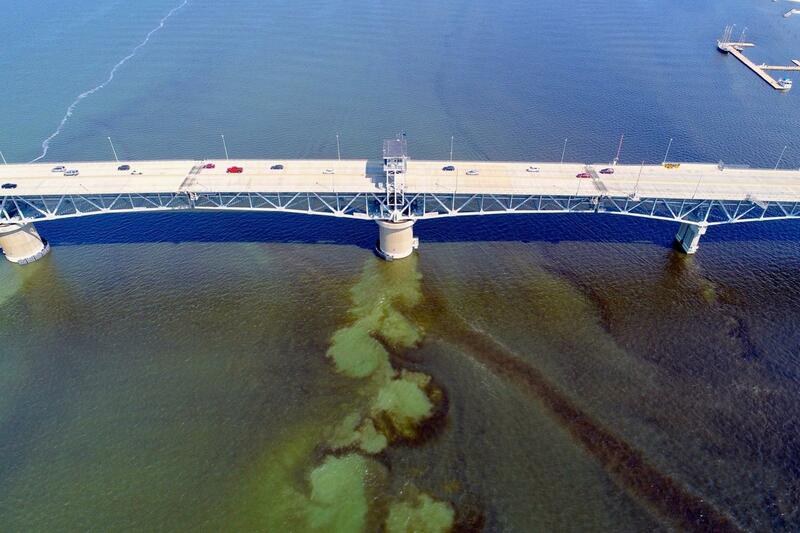 Note the turbulence caused by the flood tide carrying the bloom past the bridge piling. Credit: VIMS professor Donglai Gong. Harmful algal blooms or HABs are notoriously difficult to sample. They can appear abruptly when growing conditions are right, and disappear just as quickly when conditions deteriorate. They also shift with tides and currents, or even the wake of a passing vessel. Now, researchers at William & Mary’s Virginia Institute of Marine Science are using aerial drones as ‘eyes in the sky’ to guide their seafaring colleagues to the densest bloom patches, allowing those onboard VIMS vessels to collect water samples with much greater efficiency and lower cost. VIMS scientists analyze those samples to identify whether they contain toxic algal species that might threaten marine life or human health. Dr. Donglai Gong, an assistant professor at VIMS, says the drones provide a “sweet spot” in studying HABs, flying high enough to give a bird’s-eye view, but low enough to discern even small-scale streaks and patches in exquisite detail. They complement the other lofty tools that VIMS researchers use to visualize blooms—photos from single-engine aircraft and satellite imagery from NASA. “Another factor is cost,” says Gong. “You can get a very nice drone for a few thousand dollars,” whereas it typically costs hundreds of dollars per hour to operate a single-engine plane. Also, his team can deploy their drone in a matter of minutes, providing the opportunity to investigate a York River bloom almost immediately after it’s been observed from the VIMS campus or a vessel. Gong and his team use two drones for visualizing HABs. The newest, a DJI Phantom 4 Pro Quadcopter, can fly at 45 mph and for 30 minutes before its lithium-ion batteries need recharging. Its camera is equipped with a 20-megapixel sensor that can shoot both high-resolution still images and video. Gong and fellow drone pilot Lydia Bienlien, a Ph.D. student in William & Mary’s School of Marine Science at VIMS, download and share the images in real-time via a cellular connection. Gong, a physical oceanographer, didn’t set out to visualize algal blooms when he launched the drones earlier this summer. He obtained them in 2014 for studying shorelines and marshes. That connection is with Reece, fellow VIMS professor Iris Anderson, and the many other VIMS researchers studying HABs. They have quickly adopted the drone’s real-time visuals to guide their sampling in the York River. “We’d been a little bit blind until we had these new tools,” says Reece. 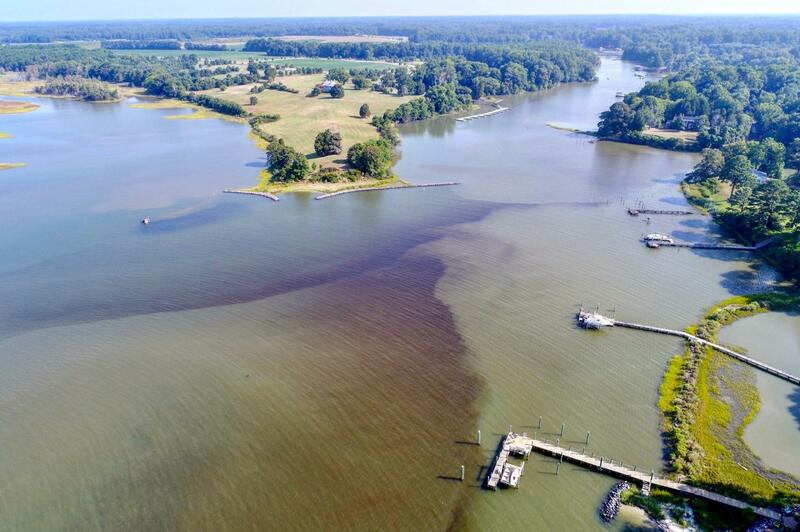 Anderson is the lead investigator on a recent grant from the National Science Foundation awarded to help better understand and model how algal blooms affect the cycling of carbon through estuaries like the York River. The drone imagery is helping her team better use their own high-tech research instrument. These are bloom streaks in the York River at the mouth of Timberneck Creek near the Catlett Islands on July 27, 2017. Credit: VIMS professor Donglai Gong. “That’s why it’s difficult to get samples in the right place,” adds Reece. “The bloom is very dispersed. You can sample 40,000 cells [per milliliter] in one patch and 40 cells outside it—there are really big differences in concentration.” “The chemistry of the water completely changes as well,” says Anderson. “But with the drone, we can now actually see where those patches are,” says Reece. Gong and Bienlien launch the drone from a high spot on VIMS’ Gloucester Point campus, fly it out over the York River, and call in what they see to Anderson, Song, Brush, and other VIMS researchers to guide their Dataflow path. Not content to rest on the drone’s photographic laurels, the VIMS researchers envision an even broader spectrum of use in coming years. “Different algae have different pigments,” explains Anderson, “and each one absorbs a certain wavelength of light.” Indeed, previous studies by Reece’s team shows that Cochlodinium polykrikoides and Alexandrium monilatum—the two species that dominate the local summer bloom—have slightly different spectral profiles. Reece and Anderson have already begun collaborating with scientists at NASA and NOAA to develop algorithms that would use these spectral differences to distinguish between the two algal species in satellite imagery. Now they want to apply that approach to the drone. “We’ve realized how helpful the drone is, so now we’re looking to improve our capabilities by adding the kind of multispectral sensor NASA has on their satellites for ocean-color measurements,” says Anderson.